Previously on Once Upon a Time: Second Star to the Right. This week on Once Upon a Time, it’s the SEASON FINALE! As the destruction of Storybrooke seems imminent, everyone must learn to work together in order to prevent disaster. In Storybrooke, there are new alliances, a few sacrifices, and the revelation of a new “Big Bad.” In Neverland, we catch up with where Hook and Baelfire left off last week. In Neverland, Hook and Smee speculate that Bae might belong to “him,” and wonder what they might receive as a rewarding for returning him. However, when Hook goes to question his captive, the revelation that he’s Milah’s son changes his mind. Smee panics as the Lost Ones arrive looking for Bae, but Hook is unwilling give up the key to his revenge. Luckily Bae remains hidden. During a sailing lesson they bond over being abandoned by their daddies, and Bae reveals his father is the Dark One and the dagger is the key to his demise. Later Bae discovers a drawing of his mother on Hook’s desk, and concludes Hook is the pirate that killed her. Hook quickly tells him the real story, but Bae still blames him for destroying his family and asks to be taken home. 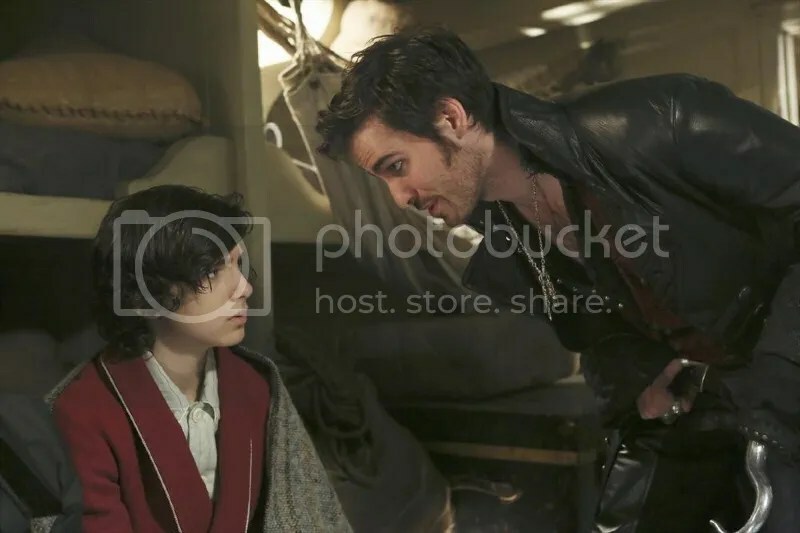 Hook offers Bae a place on the ship, but the boy is not convinced, claiming that the pirate only cares for himself. It’s enough to turn Hook back to revenge, and he gives up Bae to the Lost Ones. As they hit shore, the Lost Ones compare Bae to a drawing and realize he’s not the one “he” is looking for, but that “Peter Pan never fails.” The boy on the drawing? Henry. In Storybrooke, Rumple is clearly still worried about the Prophecy and is about to use magic to send his grandson flying from a swing into some convenient pointy rocks (what is it with the death trap playgrounds in this town?) when he’s interrupted by the arrival of the Charmings. As Emma breaks the bad news about Neal to Henry, her parents inform Rumple. They also ask for his help with the self-destruct device, but with his son gone, Rumple doesn’t mind dying. Meanwhile, Gremara take the device down to the mines and activate it. As the Charmings regroup at home, Regina offers to slow down the device to give them enough time to recover the magic beans and portal everyone safely to the Enchanted Forest. Hook arrives, gets punched in the face, and offers to help, since dying wasn’t part of his revenge plan. At Gold’s shop, the dwarves raid Sneezey’s stein since the Blue Fairy has conveniently created a potion (with a hair from Pinocchio’s head) that will restore a person’s memories if drunk out of an object that’s important to them. Leroy offers some to Rumple, since he owes Belle a favor. As the forest starts to reclaim the town, Rumple and Belle have an emotional reunion. Charming and Hook manage to snag one bean from Gremara; Regina prepares to sacrifice herself to save Storybrooke, begging Emma to “let her die as Regina,” not the Evil Queen. Everyone meets up at Granny’s and prepares to go, but Henry refuses to leave without Regina. Snow suggests sending the trigger through a portal like the wraith (since that worked so well the first time), instead of “building a future on Regina’s blood.” Of course, they go down to the mines to discover that Hook has double-crossed them and taken the bean. Convinced they’re doomed, Emma shares a tearful embrace with her parents, calling them “mom” and “dad” for the first time. (Hello emotional turmoil, I’ve missed you!) She then has a “holy crap I can do magic!” moment and combines her powers with Regina, saving everyone from horrible CGI destruction. During the confusion, Gremara kidnap Henry and take him through a portal to “him.” Hook arrives shortly afterward with the bean. Regina, the Charmings, and Rumple sail off to Neverland to rescue Henry, while Belle stays behind with a spell to cloak the town from further minions of the Big Bad. 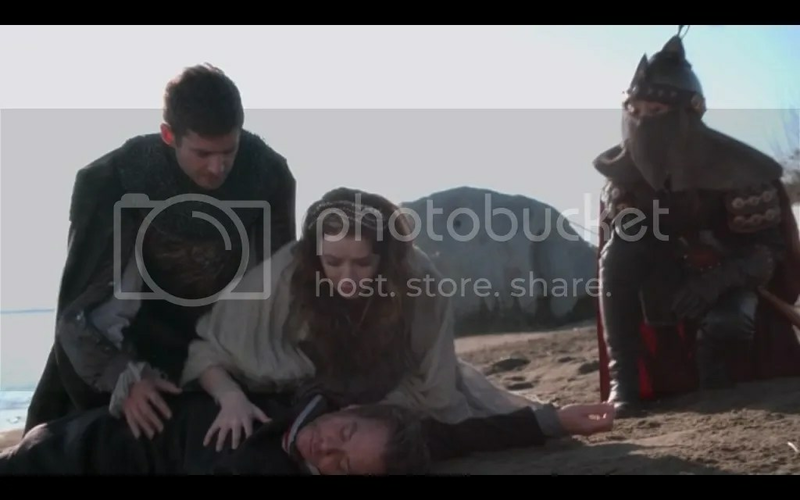 In the Enchanted Forest, Aurora, Philip, and Mulan discover a gravely wounded (but alive) Neal on the beach. That’s it until the fall. Stay magical, my friends! • Coming to the end of the season, I find myself a little disappointed. The latter half of season 2 just did not pack the same punch as the first half, nor did this season have the same sense of purpose that season 1 did. This fracturing of one plotline (break the curse) into multiple plotlines (Cora in Storybrooke, finding Baelfire, the magic beans, the Prophecy, Neverland, Greg and Tamara vs. Magic) has made the show feel convoluted and disjointed. With so much going on, the jump from plotline to plotline takes away from character development – i.e., the evolving nature of Emma and Snow’s bond in the first half of season 2 that we don’t really see upon their return to Storybrooke – and leaves a lot of plot holes. • The rules of travel between realms are infinitely frustrating to me. Rumple’s implied scuffle with Peter Pan suggests that Rumple traveled to and from Neverland at least once, and it’s never explained how Hook returned to the Enchanted Forest, especially considering you can “never leave” Neverland. And the dynamic of the magic beans seem to vary: when Neal falls through the portal, it’s implied his destination is totally random, yet when Gremara and Hook use the beans, they have no issue choosing Neverland as their destination. • Henry is subject of the prophecy, and also the objective of the “big bad,” Peter Pan. Considering we now know that both of his parents are magical, how much do you want to bet that Henry’s got some magic of his own? I have a feeling this will be one of the big storylines of season 3. • New drinking game: very time Hook gets assaulted or double-crosses someone, take a shot. 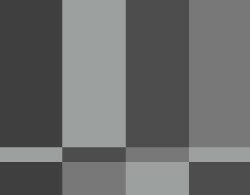 Nicole N. decided to justify the countless hours she spends watching television by writing about it here. She is currently watching Call the Midwife and crying into her tea each Sunday. For more tv-centric musings, check out her tumblr.